Helping make more fish . . naturally! We are people from around Australia who help make fish happen by protecting and improving habitat that fish need to survive and thrive. The Fish Habitat Network began in New South Wales in 2009 and has since expanded to include people from other States and Territories. Individuals, communities, organisations and government are working together to bring the fish back and ensure that our aquatic environments and fish communities are healthy, diverse and sustainable for future generations. So join us and get involved! Help make fish happen . . . naturally! Fishers for Fish Habitat Forum was held again in 2018, back where it all began nearly 10 years ago in Ballina, northern NSW! 88 participants from the surrounding region and as far afield as Sydney and Dubbo in NSW, Port Phillip Bay (Vic.) and Moreton Bay (Qld.) made it to Ballina for the Forum to hear presentations on all things fish habitat, how to get funding and how recreational fishers are geting involved..
Special thanks to Richmond Oysters for supplying oysters for the real-time water filtration experiment and to OzFish Unlimited, South Lismore Duck Pond Landcare, Kyogle Council and Kyogle Fishing Club for their involvement in the “Richmond River Roamings” bus tour. The Forum report and programme can be found on the NSW DPI Fisheries website here. National Fish Habitat Strategy ready for action! Ozfish, FHN and FRDC have developed a National Fish Habitat Strategy to help protect and improve our recreational fisheries into the future. Recreational fishers need to work together if we want to rehabilitate our waterways and bring the fish back - the strategy aims to help this happen. The draft strategy was opened to public comment and further comment provided at a "Habitat Round Table" held prior to the National Recreational Fishing Conference in November 2017. Ozfish has now incorporated these into a Final National Fish Habitat Strategy which will be adpoted by State agencies and peak fishing groups across Australia. Thanks to all fishers who provided feedback! Click on the cover of the Strategy to have a read and see how you and your fishing club can work with funding bodies and agencies to improve fish habitat in your area. Fish Friendly Marine Infrastructure - think about the alternatives! Our coastal and estuarine habitats are increasingly under threat from urbanisation and human habitation. In an effort to manage these areas, coastal infrastructure has been installed to provide access and store marine craft, control erosion and protect assets. This has led to construction of sea walls, marinas, pontoons, jetties and boat moorings which reduce shoreline complexity, increase shading effects, or directly remove habitat. Many of these existing, necessary, structures impact negatively on surrounding coastal key fish habitat such as seagrass meadows, mangrove forests and endangered ecological communities of saltmarsh, resulting in long-term negative influence on shoreline biodiversity and productivity of local fishery resources. The good news is that new concepts in coastal infrastructure design, and alternatives to traditional construction and management techniques are providing opportunities to improve the biological diversity on, in and around these structures. By modifying, upgrading and retrofitting existing marine infrastructure and incorporating new designs when installing new infrastructure (sea walls, marinas, pontoons, jetties and boat moorings), you can lessen the impact on aquatic flora and fauna and be "fish friendly"! The 3 winners report back! NSW DPI Fisheries put the call out to find 3 high achieving recreational fishers who would be funded by the Recreational Fishing Trust to attend the World Recreational Fishing Conference in Canada in July and visit a number of on-ground habitat rehabilitation projects in the USA. Anne Michie from Tamworth, Matthew Hansen from Dubbo and Braeden Lampard from Mildura all impressed the judges with their track record in improving fish habitat, their plans to “dream big” and their passion for recreational fishing. The trio are now back in Australia, inspired after visiting habitat improvement projects in northern USA and Canada, and have hit the ground running. World Fish Migration Day - 2018 - it's a wrap! World Fish Migration Day (WFMD) is a one day global-local event to create awareness on the importance of open rivers and migratory fish. All around the world we have built barriers such as weirs, dams and floodgates for water management, hydropower and land drainage. These barriers in rivers and on coasts prevent fish from migrating to reproduce, feed and avoid predators. 552 events in over 63 countries focussed attention on the highs and lows of fish migration around the world. More: https://www.worldfishmigrationday.com/ or search the map. 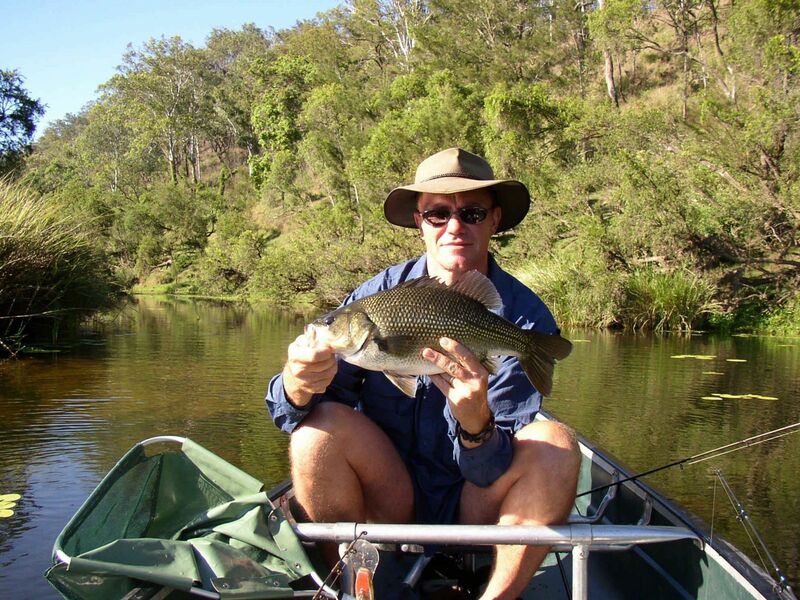 In Australia, there were trees planted for fish in North Queensland’s Burdekin River; a celebration of the Dubbo fishway on the Macquarie River, in central-west NSW; celebrity fun and games at Koondrook, in Victoria; and a continuation of the great work being done by for Australian Bass in the Nepean River by Bass Sydney. In Europe, Rik Bomer made a ‘Happy Fish Tour’, cycling nearly 4000km across Europe, visiting rivers where fish now migrate and the people who made this happen. The community found out more about the fish habitat in South Africa’s Mooi River; and hundreds of people help remove water hyacinth to help migratory fish in Lake Tana, Ethiopia. In England, volunteers helped Salmon continue their journey to the sea by collecting smolts above a barrier on the River Tyne so they could be relocated downstream. Finnish film-makers have documented the impact of old hydro-infrastructure of the now-endangered Finnish migratory fish species (‘Concrete reasons’). And Jeremy Wade, of River Monsters fame, made his plea for flowing rivers and fish access to habitat in a short video.